Housing • Building permit numbers rise locally, sales climb in most regions of country. 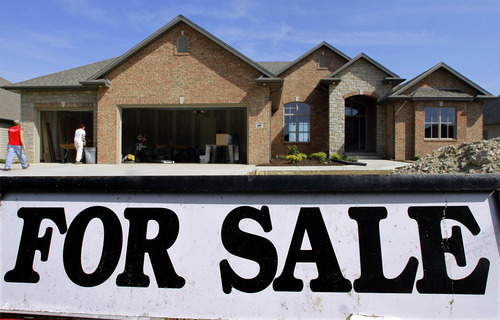 (AP Photo/Seth Perlman) A pickup in hiring and cheaper mortgages, combined with lower home prices in most markets, has made homebuying more attractive, although the pace remains weak. The data for Utah's most populous area was mirrored nationally. The Commerce Department said Wednesday that sales of new homes increased 3.3 percent from March, to a seasonally adjusted annual rate of 343,000. On Tuesday, the National Association of Realtors said sales of previously owned homes increased 3.4 percent, to a seasonally adjusted annual rate of 4.62 million. That nearly matched January's sales pace of 4.63 million, which had been the best in two years.